Before I start this post is just like to point out the irony that the day we discovered the subway was also the day we ended up walking 18 miles!!! So, day 3, time to see one of the seven wonders of the world…or so we thought! We got up early, had our breakfast in the hotel (which they forgot to charge us for) and got dropped off outside the train station by a taxi. What followed was comical when we looked back on it. We queued up for 10 minutes only to be told to go to queue 2, we went to queue 2. We were then told to go to queue 3. We went to queue 3. Then we were told to go outside. We went outside. 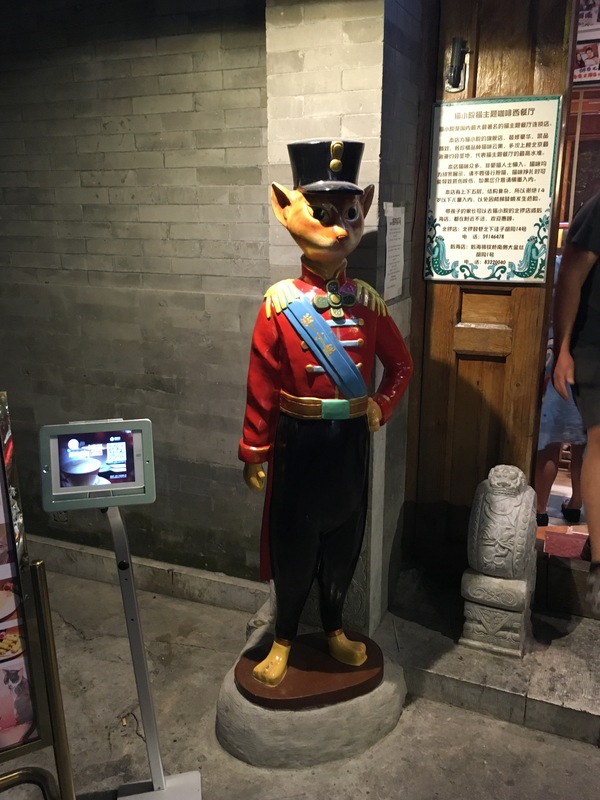 The kiosk for the Great Wall train was closed. Tickets didn’t go on sale until half 1 (3 hours away) and the train didn’t leave until half 3! 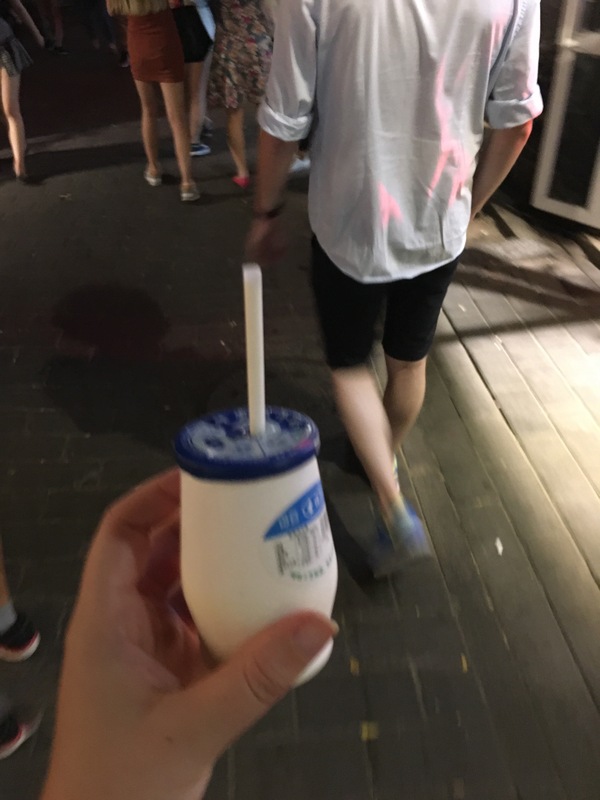 This was to go to the popular Badaling point…needless to say we weren’t the only confused tourists. 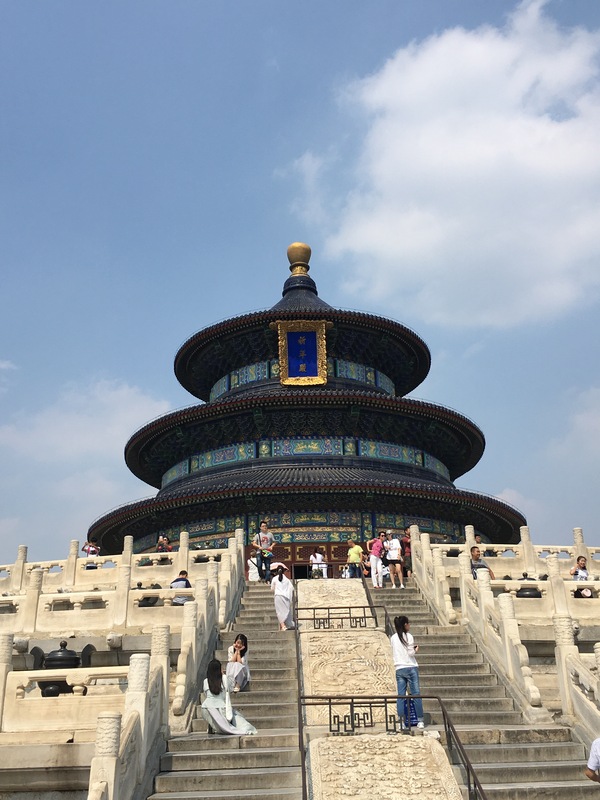 But what started as a crappy day quickly changed into s day if adventure, exploring the Temple of Heaven, both the pearl and silk markets as well as getting on and off the subway, which was 2-4 Yuan at most per journey, which works out at 20-50p! After relaxing, showering and changing back at the hotel we asked the concierge about a great duck restaurant. They told us about two just round the corner which were pretty famous. The first, something Dong, was in a department store in the 5th floor. As soon as the doors opened it looked super ritzy so we, rather embarrassingly, pressed the ground floor button and left red faced. We then went into the other one, 1949. Unbelievable! 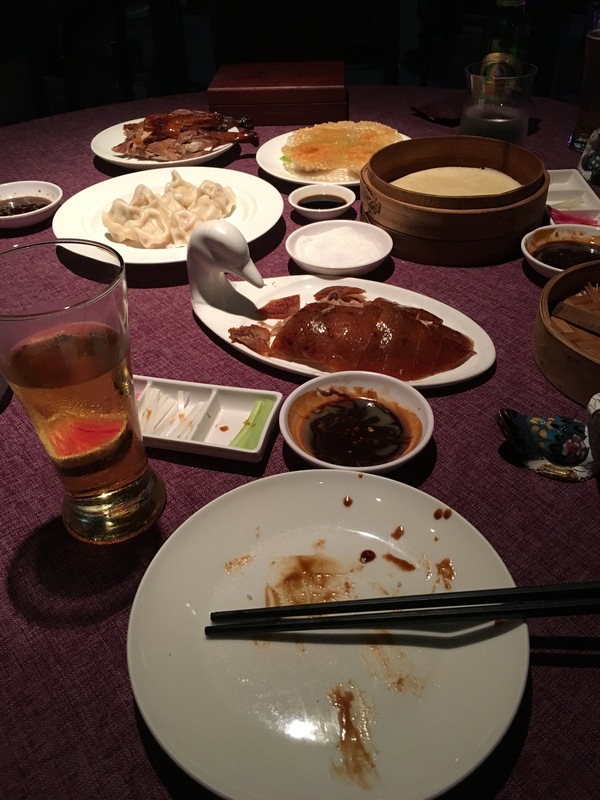 Famous for their Peking duck we ordered one between us and when it arrived the waiter banged a gong, while the waitress mixed peanut sauce, sesame sauce and fried garlic into our hoisin sauce before swirling it round to make s gorgeous mix of colour. As the chef was cutting the duck into slices the waitress showed us how to eat it by preparing s pancake each for us. You dip the duck into the sauce and place it in the pancake and then add one, and she meant only one, piece of gonger, cucumber and onion before wrapping it up neatly and enjoying it! We then took the skin as costed it in sugar…now you can ask my Mum – I’m not a fan of skin on meat etc, I really am quite fussy, but this was one of my all time favourite meals, truly incredible. Oh and we got dim sum and traditional gyozas too, needless to say we were stuffed! The meal cost just over £60 but between us and for the attention to detail, ambidnce, service and food it was well worth it! But we weren’t ready to go home just yet. Oh no. 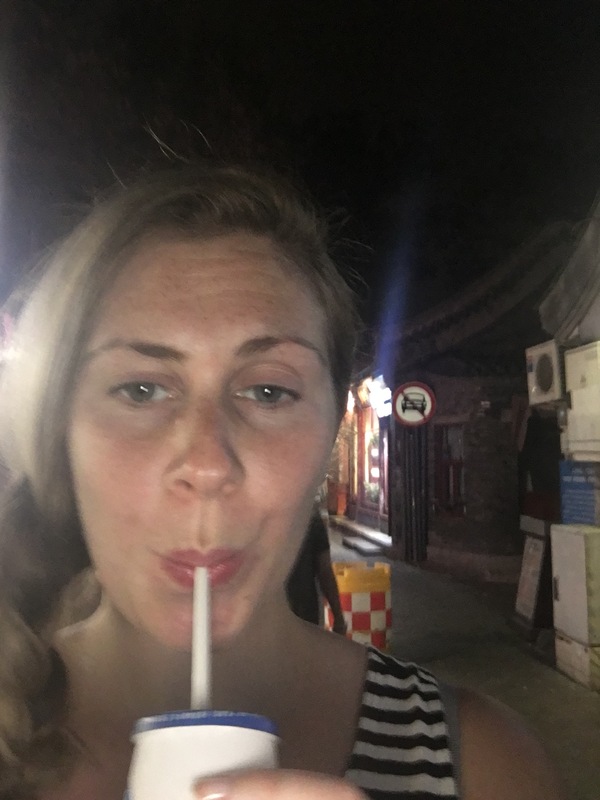 Now that we had become super savvy users of the subway we decided to catch a train over to Hor’hi to explore one of Beijing’s most famous Hutongs. 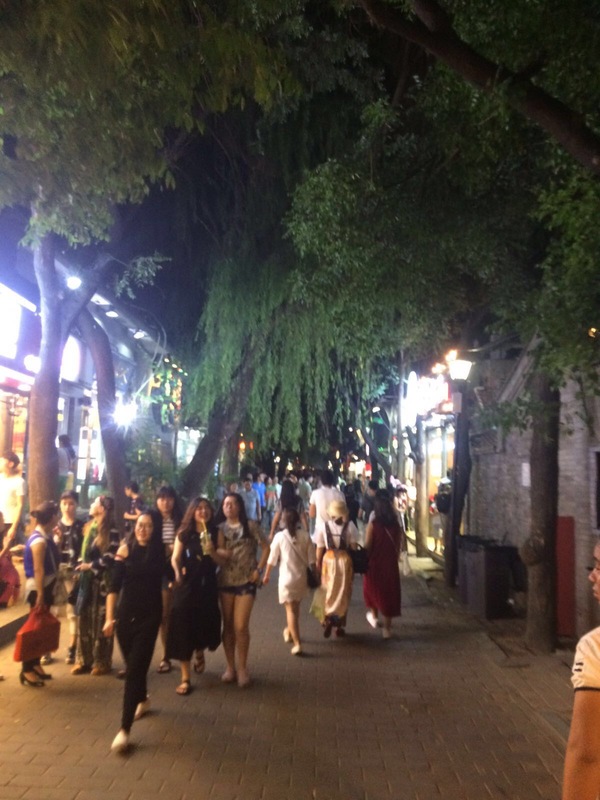 A Hutong is where a community of people live and work, welcoming people to eat, drink and even stay in hostels. You can explore certain side roads too to see where people live. This was one of the most charming places I’ve ever visited. They’re not all like this of course, but the government wanted to tear them all down in favour of building the skyscrapers we see all over Beijing as we know it today and people really had to fight to keep them…and I’m so glad they did! 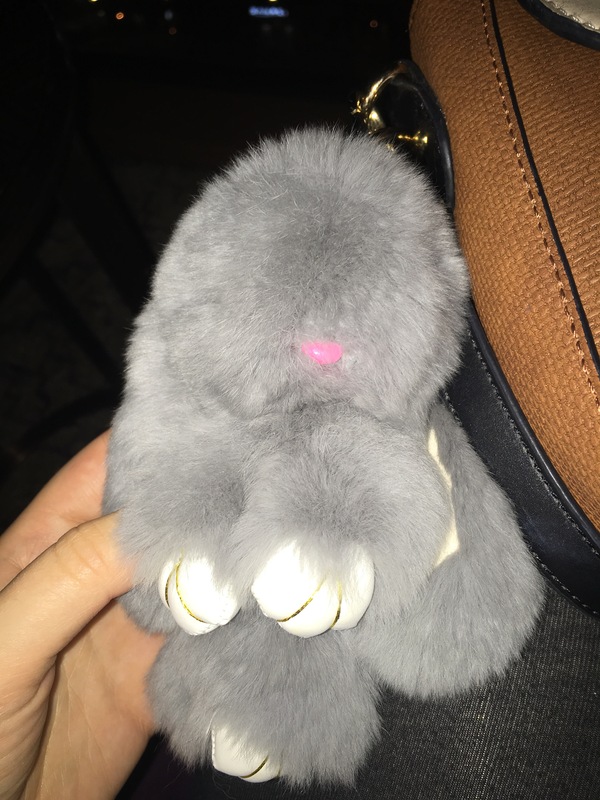 While there I bought a bunny keychain to attach to my bag (the markets wanted 60 Yuan, got it for 20)! I also treated myself to a white carton with s blue top that I’d seen everywhere, I mean people are obsessed with them, they really are. Turns out it was yoghurt…yummy too! 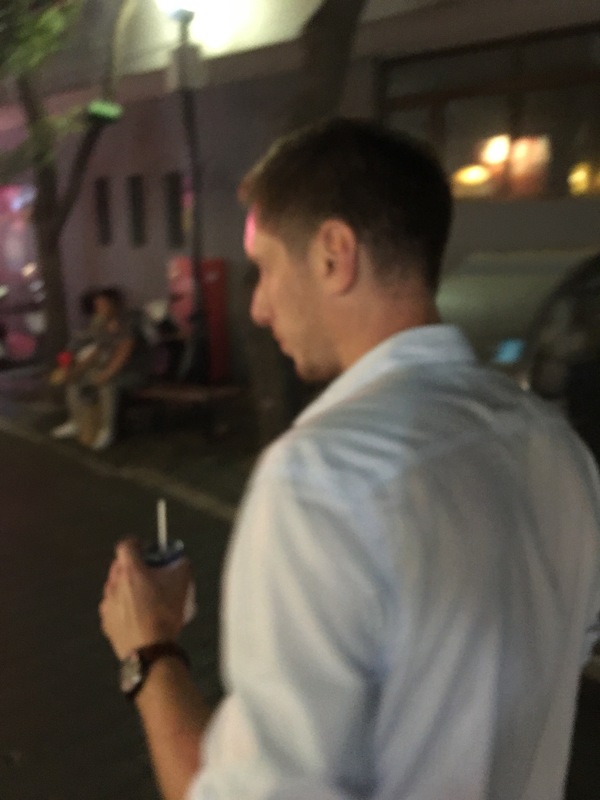 On the walk back we managed to stumble out of the Hutong and onto the street m, walking for mikes to find the subway. On the way though we found the drum and bell towers…happy exploring! When we finally got home we had a cuppa and looked out over Beijing…I think we’re finally coming to grips with this place!